At nine years old I knew beyond a shadow of a doubt that the only toy that could possibly bring me pure bliss would be a Transformer. I had quite a few "transforming" vehicle toys, a submarine, a strange plastic alien ship of sorts, and even a ray gun that lit up and made noise. But not one of them was a Transformer. They came in boxes covered in Chinese characters. Some, like the ray gun had artwork that made the resemblance to a real Transformer almost impossible to see past. A few were truly heavy die-cast pieces that in hindsight I can appreciate for their craftsmanship. However, as a child I saw them as just "Not a Transformer." They had no names, or at least none I could make out from the boxes they came in. They had no background stories, other than those I created on my front stoop. They were not on the cartoon. They were not Transformers. My friend Steve from next door had a few of these "fakes" but HE had real ones as well. He had Optimus Prime. He had Soundwave with his mini cassettes. He had joy. I wasn't particular about which Robot in Disguise (TM) I wanted. I just wanted one. So I devised a plan so ingenuous that there was no way it could fail. I didn't ask, insinuate, or even glance at toys for a month whenever I would go shopping with my mom. I would bide my time and then strike when she least expected. This caught her attention, but she didn't say anything for a while. It was a rainy autumn Saturday when she finally broke and asked if I wanted to go look at toys. I just shrugged. I thought I was acting nonchalant. My mom saw right through me. She just sighed and called me out, "Okay, what's this toy you want that you're afraid to ask for?" I said it was nothing really... Then I dragged her to the Transformers display. Her reaction, "Don't you have a bunch of these?" I tried to explain the difference between what I had and what I wanted. I plead my case. I brought up the cartoon. I brought up Steve. I brought up my need for joy! My mom just looked at me like I was insane. "Just pick out the one you want so we can go home." I was stunned. I reached over and grabbed Bumblebee and shoved it in my mom's hand before she changed her mind. When I got home I was careful in freeing Bumblebee from his cardboard prison. 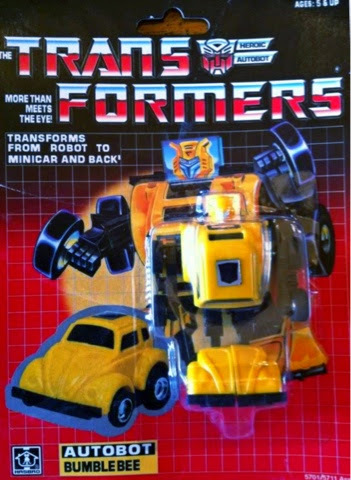 This was my first real Transformer and I was going to read and reread the packaging until I was satisfied that I had it memorized! The artwork on the card mesmerized me. The grid pattern drove my tiny brain crazy. I hadn't even played with him and already I was in love with Bumblebee. Then I set about to transform him. That wasn't as exciting as I had imagined. I don't know what I was expecting. Maybe sound effects like on the cartoon? Maybe the Trasformers theme song to just play from out of no where? I don't know , but whatever it was, it didn't happen. Transforming him felt the same as my other robot vehicle guys. Sure he had a neat heat sensitive rub sign, but otherwise... Eh. I still played with him quite a bit, and enjoyed the lunchroom status he garnered for me among my male friends, but in the end I think I loved my transforming ray gun just a little bit more.